What’s better than your standard NFA defying Shockwave 590? The Shockwave 590M, the M, standing for the magazine. 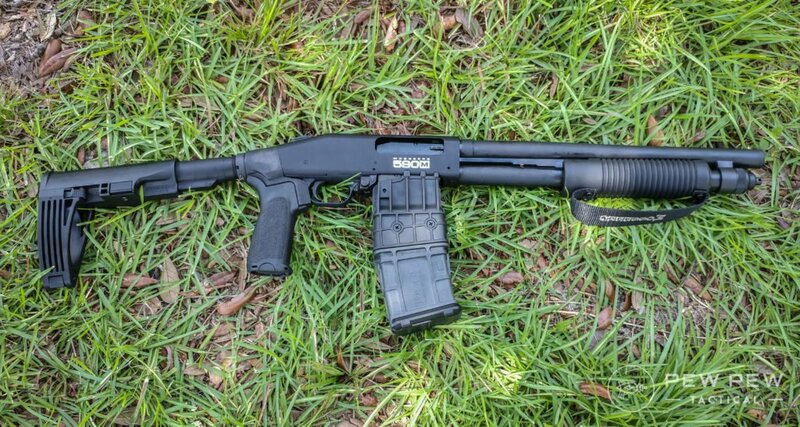 The madmen at Mossberg took a fun gun and made it more fun via the addition of a 10 round magazine. Oh, but that’s just the magazine it comes with. The M series of Mossberg’s guns isn’t just the Shockwave, but two models of actual 590 Shotguns. They premiered at SHOT Show 2018 and the Shockwave variant was released just a few months ago. Mossberg premiered the M series with 5, 10, 15, and 20 round magazines. The Shockwave itself is already an NFA defying firearm. This weapon is a 12 gauge, pump action, firearm that is totally not a shotgun. 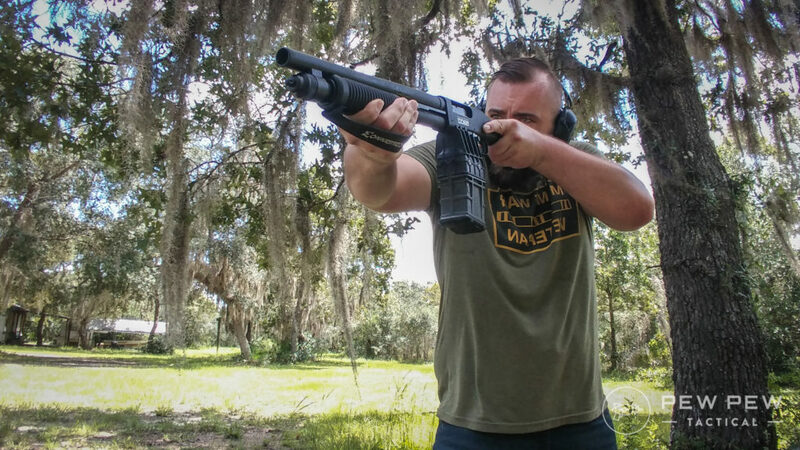 By US law the Shockwave is just an “other firearm”, and because it’s not a shotgun it can have a barrel shorter than 18 inches as long as it has an overall length of 26 inches. American gun laws can be an odd assortment of nonsense, but sometimes they work out well for us and the Shockwave worked out well for us. It’s a fun gun and its inspired multiple models, including some from Remington, Charles Daly, and even semi-auto AK pattern variants. I love shotguns, so naturally, I love these 12 gauge firearms. Their NFA defying features make me giddy and I love the challenge they present to me as a shooter. The M Model is something that’s both cool and somewhat ridiculous. 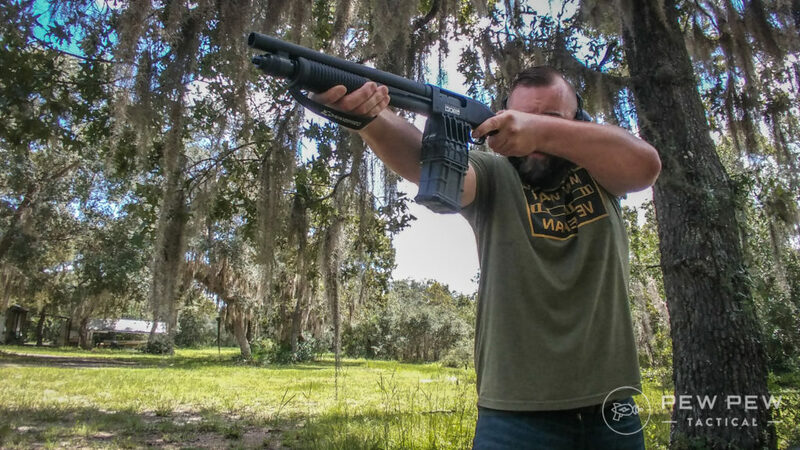 The original Shockwave is a lithe, lightweight gun. The Shockwave 590M is a bit bigger and heavier with the magazine breaking up the relatively small profile of the gun. The Shockwave does grant you the substantial increase in capacity. The stock ten round magazine doubling the capacity, and the 15 and 20 rounder adding even more ammo capacity to a small platform. These magazines are double stacks and compact in length, but not width. They are meaty, and the 10 rounder weighs about a pound unloaded. They are made by Adaptive Tactical, a company known for their shotgun magazine conversions. The magazines are pricey, with the 15 and 20 rounder costing in excess of a hundred bucks at most retailers. I will say they are well made and reliable, more on that inside. If you want to see a smile plastered on my face hand me one of these guns and take me to the range. I always enjoy shooting them. The fierce recoil is part of the fun to me. Some people ride dirtbikes, some people race cars and ride bulls, and I shoot small 12 gauges without stocks. The technique and challenge in controlling one makes me happy. When I see buckshot hitting exactly where I want it to with one of these guns I get downright giddy. So yes, I like shooting the Shockwave 590M, but looking objectively at the platform I can tell you a few things you need to know. First, this gun is not for everyone. It’s hard to control, especially when you move beyond birdshot and into buckshot. Mossberg’s manual advises you shoot from the hip, but that seems unsafe to me in terms of knowing what you are going to hit. That brings me to my second point, aiming the gun and recoil. You can, with proper technique, aim this gun with a reasonable degree of effectiveness. The method I use is pushing forward with the nonfiring hand and pulling rearward with the firing hand. This method creates tension and helps stabilize the firearm throughout its recoil impulse. While holding it, you aim it like a stocked shotgun. If you are doing it right, you won’t punch yourself in the face. After you shoot you relax the push and pull, and then rack the gun and go right back into the push-pull mode. This tension and muscle control can grow fatiguing, and after ten rounds in a rather rapid manner, you’ll feel it. It’s almost a workout after a bit, but a fun one. The weight of the gun without a stock, the extra weight of 10 rounds of 12 gauge, and the recoil will give you a solid upper body workout. Lastly, firing this gun isn’t painful. (Unless you punch yourself in the face.) As someone who’s handled shotguns with pistol grips, I can say they are rarely pleasant. A 90-degree pistol grip is not comfortable and causes pain, and the Shockwave Raptor grip is a pain-free pistol grip. The Shockwave 590M features some impressive ergonomics. I was worried that the magazine would make it feel unwieldy, or I guess more cumbersome, but this wasn’t the case. The magazine is positioned where you would typically load shells. That puts it dead center of the gun. The magazine placement aids in balancing the weapon, even with a full metal it doesn’t pull you one way or the other. 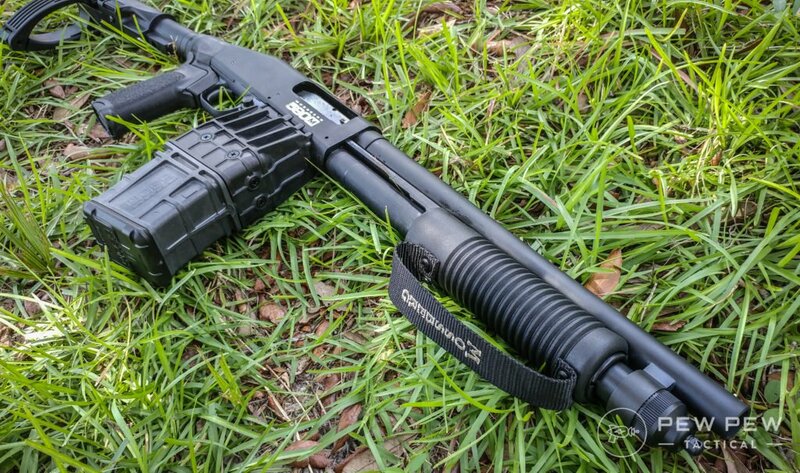 The Shockwave Raptor grip makes it very easy to reach the Mossberg’s Tang safety and slide it with ease. The Raptor grip is comfortable and fills the hand and the pump is a corn cob forend with a strap over it. This loop is a safety device that keeps your hand from getting in front of the barrel and potentially preventing the loss of a few digits. The idea is excellent, but the execution needs refinement. The strap is held in place by two screws, and those screws are on the inside of the loop. Recoil can cause these screws to come back and bite your hand if you hold it too close to the front of the pump. It can and will break the skin so be cautious how you hold it. The magazine release is perfect. It’s ambidextrous, and all you have to do is push it right or left, and you can remove the magazine. The magazine rocks in slightly like an AK magazine, but not as dramatically. The near useless tube houses a catch for the forward lip of the magazine. Its pinned in place through the tube. I did notice it takes more force to work the action and the pump is way less smooth than a standard Mossberg. It’s rough, it’s gritty, and it takes real power to throw it forward. This is because the pump rolls over the magazine, which creates tension due to the upward pressure. I also noticed the trigger is much stiffer than a standard Mossberg 590. I’m not sure how and if this is an effect of the magazine or not, but its worth noting. I mean – it is a shotgun with a 15-inch barrel and just a pistol grip, so how accurate is it? We can’t precisely measure groups but it’ll put buckshot where you need it to if you do your part. Accuracy is subjective in general with a PGO 12 gauge it’s super personal. It’s also not a factor I’d consider when buying a gun like this. Here is the real key to success. 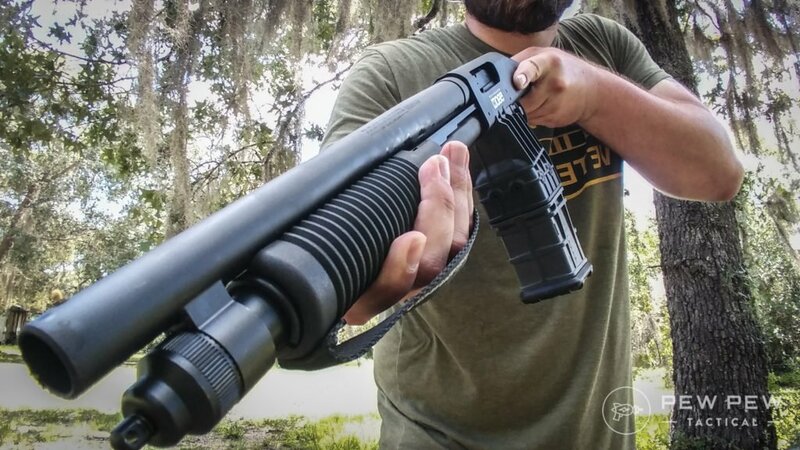 A pump action shotgun is a simple thing, a simple idea that works and works well. Does adding a magazine risk that? Good question, and so far, nope. A few hundred rounds of birdshot and couple dozen buckshot proved the magazine worked and never stalled or failed to feed. The faster and harder you pumped the gun the easier it will cycle. One, and the only, magazine issue I had was loading it. Holy Crap is this spring strong. Past round 8 and I was shoving shells with one hand to load the other two. The other issue is the rim of the shell catching the brass collar and refusing to go all the way back. This requires some finagling to make work, but you learn to load it smoothly after a few tries. Do you like fun? 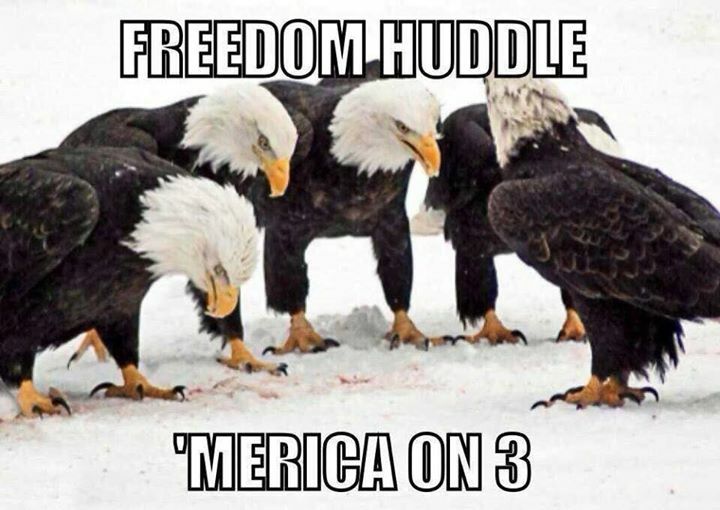 Dumb, freedom style fun? If yes then this gun is for you. If you are super serious, and say, “Train like you fight,” more than once a day then this thing likely isn’t for you. It’s a fun gun, and it may have some minimal self-defense roles, those roles aren’t going to apply to most everyday joes. 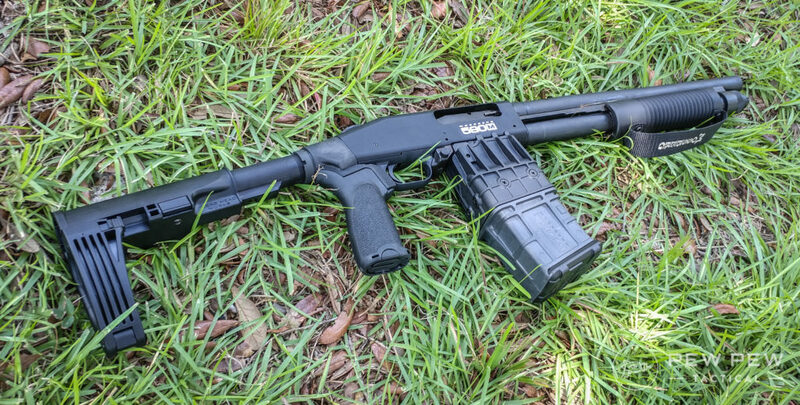 If you want a home defense shotgun – choose the Mossberg 590, or even the magazine fed 590M over the Shockwave. If you want a fun gun, this is the route to go. It’s a little ridiculous, but it puts a smile on your face. With all this in mind, what can we do to make it better? You could also do the Form 4 route, pay 200 dollars, fill out some paperwork and wait six months to have an SBS with a 15-inch barrel and a proper stock. Alternatively, you can add a stabilizing brace to the system. Yes this is legal to do, and plenty of people have done, it including me. I added an Ergo adapter that allows me to add a AR 15 buffer tube and an AR pistol grip. I added an Ergo grip and then went with the Gear Head Works V2 brace. The V2 is an adjustable brace that can slide up and down on a proprietary buffer tube. The use of a proprietary buffer tube means there is no risk of “Constructive Possession” when you own this set-up and a lose AR 15 stock. With the stabilizing brace, the gun is much more manageable and easier to use. It makes more sense as a defensive firearm and is a lot easier to shoot in this configuration. I only just got the Shockwave 590M, but I’ve got a Magpul pump on order too. My other Mossberg wears one, and I love it for attaching accessories. The gun is also drilled and tapped for a scope mount, which makes it a natural fit for a red dot optic. It’s a pump action shotgun they added a little complexity too. However, it still works, without a single hiccup. The magazine feeds reliably, the gun pumps like a champ, and it just runs and runs. It’s a PGO shotgun, what kind of accuracy can we expect? I mean I can put buckshot where it needs to be, and that’s good enough for me. I mean its a 12 gauge, so…. The only reason it gets a 3 out of 5 is that handling a PGO shotgun is difficult. In general, the weapons weight, sight, and controls are all great. The controls work well and are easy to reach. I’m torn here. I love the looks of a shotgun with a short barrel and bird’s head grip… but the magazine makes it seem odd. It looks much better and more natural with the brace than the alternative, but there it is. 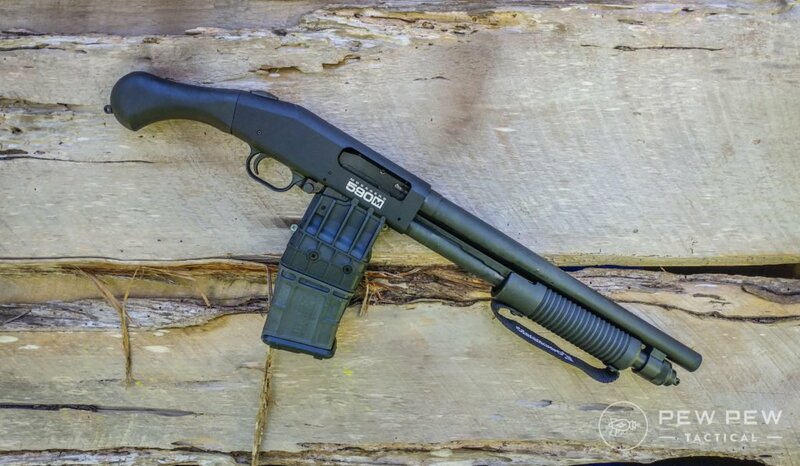 Its a Mossberg 590 and at the end of the day you can swap and change parts at random and as often as you want. The 590 and 500 by extension is one of the most popular shotguns in the world, and there are tons of parts for it. 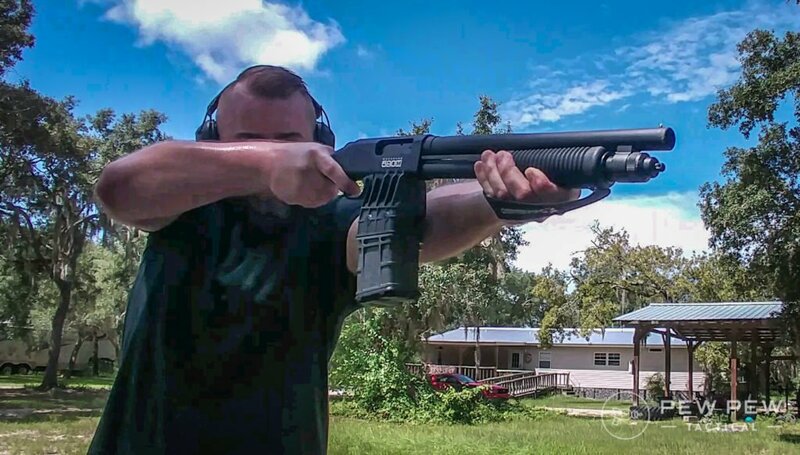 If you want a workout, you’ll get one from the Mossberg 590M Shockwave. Fire 50 rounds through it, and you’ll feel it. Your arms and shoulders will be tired from the tension method, and your fingers will be exhausted from loading the gun over and over. Its so much fun though, and so utterly ridiculous. I love it. It’s a fun gun, and a weapon I enjoy. It’s not for everyone and its pricey for a fun gun, but still its fun. So, what do you folks think? Is it for you? 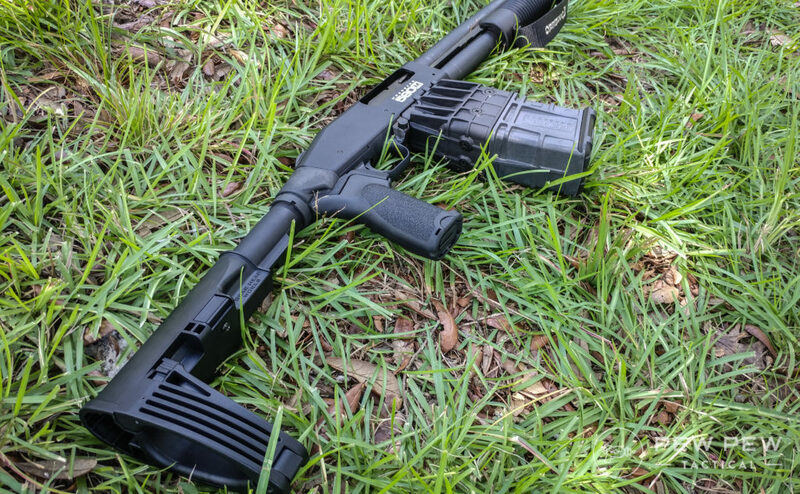 For more awesome shotgun and Shockwave content, check these out: Mossberg Shockwave, Remington Tac-14. Most gun reviews are bad at best, turning into a battle of opinions, yours was not. Thanks for seeing this one from all around! Good job.